The demands of high-volume production means "the most portable games console ever created" is going to take a little longer to arrive. 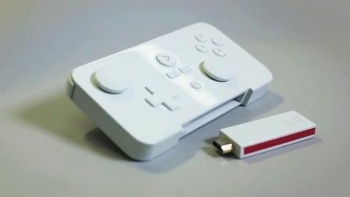 The Android-powered GameStick did pretty well for itself on Kickstarter earlier this year, ringing up well over six times its funding goal of $100,000. But as often happens, it's become something of a victim of its own success; early expectations of an initial production run of a few thousand units exploded into partnerships with 27 retailers worldwide including GameStop and Game, and more than 600 developers have signed on. That's good for the GameStick's long-term prospects, but the downside is that it's going to take a little longer to accommodate all that demand. "Initially, we planned on demand for around 1,000 units so we were going to use silicon molds, which is what we have used for the GameStick DEV units. These don't take much time to make, but they also cannot cope with the high volume production that we now need," the team explained in a new Kickstarter update. "As a result we have had to move to much higher end tooling which is being made in both China and Germany. To create these tools takes around 3 months and is a huge investment for us - one we can only afford to make once. Whilst this work has been underway for a while we have had to slow things down a bit to ensure we can get the final controller amendments prototyped and tested before the final tools can be finished." That slowdown means that instead of GameSticks beginning to ship at the end of April as originally planned, production won't begin until the end of May and, assuming no other issues crop up, shipments won't start until around June 10. The shipping itself will also take longer, as the sheer volume of Sticks means they'll have to be shipped by sea rather than air. Work in the other bits of faffing about that are inevitably involved in such things, and the GameSticks will likely (hopefully) start arriving on doorsteps during the last week of June. Not everyone is happy with the development, as reflected by the vitriol and demands for refunds in the comments, but the team said the delay was necessary "to ensure we don't trip over ourselves." It also promised to keep backers and potential customers up to speed with weekly production updates.